Note: If you're adding a new app, you start out by adding details on a New App Submission screen. After you save your app, the screen transitions into a tabbed interface and you'll see that the information you entered on the New App Submission screen has populated the General Information tab. Complete the fields on the New App Submission screen (which later becomes the General Information tab) as described below. When finished, click Save and proceed to the next tab. A title for your app, used only in the Developer Console. You define the title users see in the Appstore and on devices on the Descriptions tab, in the Display Title field. App Stock Keeping Unit string. The SKU is a string unique (which you define based on your choosing) for your app. For example: com.amazon.example.myapp.v1). The SKU becomes the ID for your app for your own tracking purposes. Amazon does not require or use the app SKU. However, adding a unique identifier can help you keep track of multiple versions of your app. Note that SKUs are case-sensitive and have a max length of 150 characters. They can contain the characters a-z, A-Z, 0-9, underscores, periods, and dashes. A category for your app based on your best judgment. Categories are used primarily for setting up the Amazon Appstore browse tree and for grouping together the Similar, Related, and Recommended app suggestions for users. The top-level categories are the same across Fire Tablets, Fire TV, and non-Amazon Android devices, though some subcategories might not be available for Fire TV apps. If you don't see an obvious category for your app, choose the closest fit. After you save your app, you will see Developer Publishing API keys. These keys allow you to manage your app information programmatically through the Developer Publishing API. 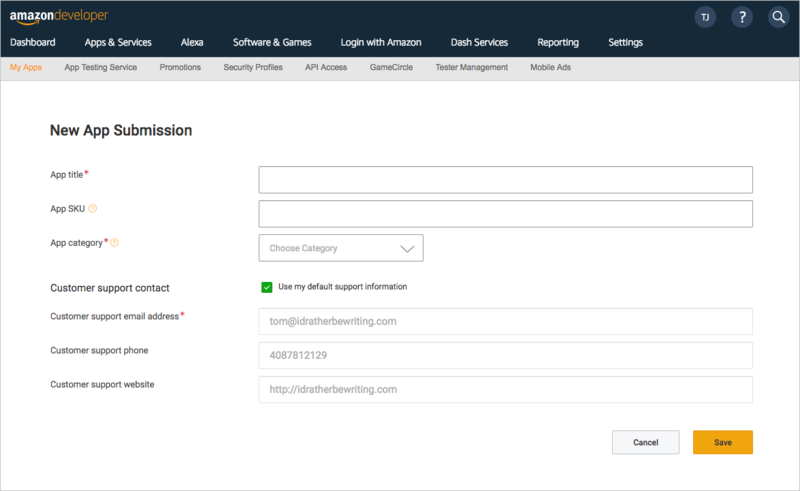 If selected, your default support information (found under Settings > Company Profile in the Developer Console) is used for the Customer support email address, Customer support phone, and Customer support website fields. An email address where customers can contact you. A phone number where customers can contact you. The URL for your app’s support website. Go to the next tab: Step 3: Availability & Pricing.